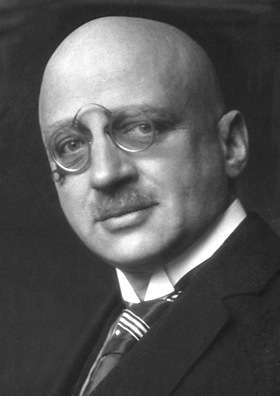 Fritz Haber was born December 9, 1868, in Breslau, Germany His father was a wealthy businessman involved in industrial chemicals. As a boy Haber gained a solid education in German schools, and, after a few tentative starts in business and organic chemistry research, mainly associated with his father’s firm, he was appointed to the Technical High School in Karlsruhe in 1893. There he refined his skills in mathematics, chemistry, physics, electricity; and thermodynamics, and developed a mastery of physical chemistry and chemical research. His extensive research efforts resulted in two books: The Theoretical Basis of Technical Electrochemistry (1898) and The Thermodynamics of Technical Gas Reactions (1905). The first book earned him the position of professor at the Hochschule. Haber’s next research project yielded his most significant achievement, a way to synthesize ammonia. The synthesized ammonia became the starting material that was oxidized into nitrates. By 1909 Haber had developed a high­ pressure, high­ temperature process for commercial production of ammonia. He identified catalysts to promote its synthesis, and his collaborator, Robert Le Rossignol, designed the ultra­ strong vessel to contain the reactants. The two textbooks and the ammonia synthesis catapulted Haber into the directorship of the new Kaiser Wilhelm Institute for Physical Chemistry of Berlin in 1911. In 1914 World War I began and Haber committed himself to the German war effort. He prepared chemicals for improving ammunition, cylinders of chlorine for trench warfare, and primitive gas masks. In 1916 he became Chief of Chemical Warfare Services in the War Ministry. Haber led Germany’s effort in poison ­gas warfare and directed the chlorine attacks during the Battle of Ypres. Germany’s defeat was a tragedy for Haber in many ways. His strong patriotism was frustrated. His wife, Dr. Clara Immerwahr, who was also a chemist, had pleaded with him to stop his work with poison gas. When he refused her requests, she committed suicide. Haber was awarded the Nobel Prize for Chemistry in 1918 for his work in synthesizing ammonia but many disagreed with his selection. His promotion of poison ­gas weapons, and his role in prolonging the war by providing nitrates for gunpowder, was not well­ received by the scientific community, especially as he not only developed the poisons but also directed the attacks on the battlefields of Europe. Haber attempted to extract gold from sea water to help pay for Germany’s extensive war reparations. This project was declared a failure in 1926. The Kaiser Wilhelm Institute continued to be the center for superior training in physical chemistry; Haber expanded its influence by supporting the National Organization of Research and promoting relationships with scientists, especially the Japanese, worldwide. The Kaiser Wilhelm Institute for Physical Chemistry began to crumble in 1933 as Hitler’s power increased. Haber was a Jew and feared Hitler’s anti­ Semitism; he resigned the directorship of the institute and accepted a position in Palestine, now a part of Israel. Haber suffered a heart attack en route and died in Basel, Switzerland, on January 29, 1934. Haber’s method of synthesizing ammonia had extensive effects in both weaponry and agricultural production. At the beginning of the twentieth century; two­ thirds of the world’s fertilizer came from beds of nitrate mined in Chile. Germany alone was buying about one­ third of Chile’s output when the supply became nearly exhausted. This prompted a global crisis in food production and forced scientists to look for alternative sources of fertilizer. Air is mainly nitrogen gas, but pure nitrogen is not readily absorbed by living tissue. It must be in soluble form, like ammonia. Haber’s process synthesizes ammonia from hydrogen and atmospheric nitrogen. Haber made possible the large­ scale production of ammonia. His method, in turn, led to increased food production based on industry­made fertilizers. NORMAN BORLAUG’s “green revolution,” which systematically helped to increase food production in poor countries, was made possible by Haber’s work. Yet there is a dark side to Haber’s most noteworthy achievement. Ammonia is the chemical feedstock for many other compounds of nitrogen that can be used to manufacture ammunition, explosives, and poison gases. As with many scientific innovations, destructive applications of ammonia synthesis were implemented alongside its beneficial uses.